The repression of civil societies activites in countries like Egypt and Russia are justified with the "protection of the states sovereignity" and the "principle of non-intervention". When unwelcomed critique is silenced, activists need all our solidarity and support. Over the past years a number of states – democratic as well as authoritarian – throughout the entire world have significantly restricted spaces for civil society actors, activists, and organizations working independent of state and economic interests for political, social, and ecological participation and human rights. Governments frequently claim that activists and non-governmental organizations (NGOs) are instruments of foreign regimes and justify their repression by invoking state sovereignty and the principle of non-intervention. In addition they claim that people and organizations with connections abroad lack democratic legitimation. Two examples of this kind of repression under the pretext of defending state sovereignty can be found in Egypt and Russia. In 2011 Egyptian authorities began investigating various NGOs, including the Egyptian Initiative for Personal Rights. These organizations were accused of working without a license and of receiving foreign funding without authorization. 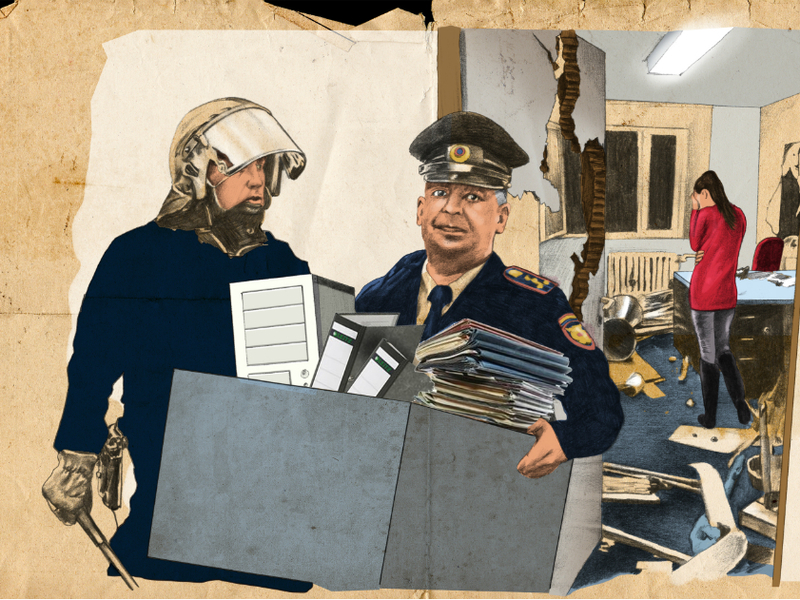 Several international NGOs, including the International Center for Journalists, subsequently closed their offices and many of their staff members were sentenced to prison terms. Since 2014 receiving unauthorized foreign funding can be punished in Egypt with life imprisonment. The Foreign Agent Law has been in effect in Russia since 2012. According to this law, NGOs that receive funding from abroad and engage in political activity have to register as “foreign agents.” They are also required to indicate their status as foreign agents in every publication and statement they produce. There have been investigations and raids, for example, against Human Rights Watch and Memorial. Additional laws prohibit accepting money from the United States and allow for a ban on undesirable NGOs. By June 2016 at least eighteen organizations, including the Committee Against Torture, have disbanded. President Putin justified this course of action by claiming that civic activities supported from abroad would undermine the sovereignty of Russia and that actors who promoted foreign interests could not speak for Russian society. The accusation that the transnational cooperation and financing of civil societies would violate state sovereignty and the principle of non-intervention is hardly tenable under international law. According to Article 2.1 of the Charter of the United Nations, all member states possess sovereign equality. These states interact on the level of international law as equals and are entitled to govern their own affairs independently. The other side of sovereignty is non-intervention: States are forbidden from intervening directly or indirectly into the affairs of other states. This does not mean, however, that all transnational support of civil society actors violates the principle of non-intervention. The International Court of Justice made clear in the case of Nicaragua in 1986 that only those activities that involve the use of force against another state violate the principle of non-intervention. There is no use of force in the transnational exchange and financing of civil societies or in the activities of international non-governmental organizations. Moreover, the principle of non-intervention applies only to those areas in which states can make decisions without being bound by the norms of international law. At the latest since the end of the Second World War, sovereignty no longer means that states are free to treat their own populations and civil societies as they please. Human rights treaties and customary international law guarantee individuals diverse civil liberties with respect to the state. For the question of whether the transnational networking and financing of civil societies is a violation of state sovereignty this means, first of all, that the activities of civil society, even in transnational form, are protected by human rights norms such as freedom of organization, freedom of assembly, and freedom of expression. On the basis of their own national sovereignty, almost all states, including Russia and Egypt, are bound to legal norms that protect the freedom of action in civil society. Second, human rights norms require independent actors who monitor their implementation. It is absurd that states have obligated themselves to respect human rights, but then refuse to allow transnational civil society to push for the observation of those rights. In 2006 the UN General Assembly stated clearly in Resolution 60/251 “that non-governmental organizations play an important role at the national, regional and international levels, in the promotion and protection of human rights.” The same holds for civil society actors in other domains. In early June 2016 the UN Human Rights Committee passed a resolution on the promotion and protection of civil society (A/HRC/32/L.29). Finally, the principle of non-intervention applies only to states. The charge of having violated state sovereignty presumes that transnational civil society actors work as an extended arm of foreign states. Through programs such as USAID and the National Endowment for Democracy, the United States did indeed provide powerful support for civil society groups and parties that played a role in the Color Revolution in Georgia in 2003, in Ukraine in 2004, and in the Ukrainian Maidan movement in 2013–14. However, this appropriation of several civil society actors—certainly an issue worthy of political discussion—should not lead us to misconstrue of the authenticity of the social battles for political and social participation that occurred at the same time. A large portion of the transnational support for civil society comes from independent donors, and many organizations that receive state funding do all that they can to maintain their own independence. Nevertheless, the reprisals described above have been aimed without distinction at independent and grassroots movements as well. Furthermore the accusation that transnational civil society activities lack democratic legitimation is unconvincing. It is correct that civil society does not have a democratic mandate through elections. Authoritarian regimes, however, can hardly use this argument to stigmatize the activities of NGOs as illegitimate. And even in states whose governments have been legitimated through democratic elections, civil society plays an important role in intervening for the interests of those people who have been excluded from the democratic process or who have little or no public voice. Civil society actors are frequently an important counterweight to other actors without democratic mandates such as international economic associations as well as to patronage structures and state power. In addition, a transnationally networked civil society is able to exercise influence only when its analyses are convincing and its work has integrity as well as social resonance. With this in mind it is important to call the developments in Egypt and Russia described above, as well as those in other democratic and authoritarian states, what they are: the attempt to silence unwelcome critique. Our response to this must not be to abandon our cooperation. Activists, including those in countries such as India and Turkey, need all our solidarity and support in order to continue to oppose the repression. This article is part of our dossier "Squeezed – Spaces for Civil Society". The civil society is globally under pressure. In many countries governments are restricting the activities of civil society organisations with targeted measures. In this dossier we deliver analysis and background knowledge, whilst exploring new scopes for action for civil societies. The German federal government sees Egypt as a state that can guarantee regional stability. But especially the support of the regime as-Sisi increases the instability in the region. It's time for a new approach to Egypt. Maina Kiai: "Our Ideas keep living on"
United Nations Special Rapporteur on the rights to freedom of peaceful assembly and of association, Maina Kiai, explains in this interview with Christine Meissler why he will never give up fighting for democracy and human rights.